A 37 percent plurality of consumers said they’re less likely to purchase from a company that supports the construction of a U.S.-Mexico border wall. Most uniting issue among consumers was donating to charities that benefit veterans and military families: 74 percent are more likely to buy from a company that does so. Companies looking to boost demand among U.S. consumers may want to consider getting more vocal about their politics: Most adults say they care about a brand’s positions on social or political issues, according to a new nationwide survey. A plurality of respondents also want corporations to put their money where their mouth is by donating to worthy causes, according to the survey that gauged the attitudes of 2,201 U.S. adults from Jan. 11-16. But companies need to be careful about their donations; many of the hottest issues are likely to entice members from one political party while pushing away potential purchases on the other side of the aisle. Fifty-nine percent of Democrats and 55 percent of Republicans said a company’s stance on a social or political matter is important when it comes to buying a product or service. And a 49 percent plurality of respondents overall said they’d want a portion of a corporation’s profits to go to causes they believe in, versus 32 percent of consumers who said it made no difference. Democrats were more likely than Republicans to care about donations made by businesses — 55 percent to 47 percent, respectively. “Companies are really being challenged to take a stand because consumers want to support companies that align with their beliefs,” Sonya Grier, a professor at American University’s Department of Marketing, said in a Jan. 19 interview. As a result, she said, some consumers are boycotting certain brands and “buycotting” others — becoming customers of a company because they support its ideological stance. Twenty-nine percent of poll respondents said that in the past 12 months they boycotted a brand or stopped purchasing a product or service from a company because of its position on a social or political issue. Seventy-four percent of respondents in that boycotting group said they’ve continued to balk at purchasing that same brand. Companies, however, need to be mindful of how they handle divisive issues in a polarized America. 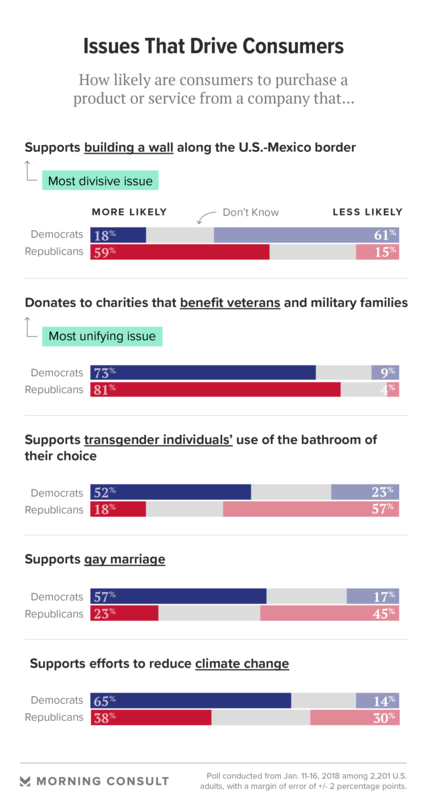 Only one issue among the 14 included in the survey garnered support from the majority of poll respondents: donating to charities that benefit veterans and military families. The list included some of the most contentious topics in the zeitgeist, including immigration and transgender bathroom policies. Seventy-four percent of adults overall — 81 percent of Republicans and 73 percent of Democrats — said they’d be more likely to purchase a product or service from a company that gave money to veterans and military families. The fact that only one issue would attract spending from both sides of the aisle shows just how divided the country has become, even in its consumerism, Grier said. In contrast, a 37 percent plurality of consumers said they would be less likely to buy from a company if they knew it supported the construction of a U.S.-Mexico border wall — making that the most alienating issue. The wall is also the most politically divisive: 59 percent of Republicans said they would purchase from a company if it supported wall construction, while 61 percent of Democrats said they’d be less likely to buy from such a business. Some brands have addressed the issue of the wall in their advertising — with mixed results. The building material company 84 Lumber’s controversial 2017 Super Bowl commercial, for example, led to calls on social media to boycott the firm. The spot chronicles a Hispanic mother and daughter’s journey to enter the United States via the southern border, only to face a wall; then a door constructed out of lumber appears. Heineken International’s Tecate took a different approach in 2016 with a parody commercial that encouraged viewers to build a wall of beers. Social media reaction was largely positive. Bjorn Trowery, a spokesman for Heineken, said the company hoped to acknowledge an ongoing conversation and unite Americans through the 2016 advertisement, while 84 Lumber declined to comment to Morning Consult on the politics surrounding its Super Bowl ad. No prominent company or brand has voiced unequivocal support for the U.S.-Mexico wall. Other aspects of the survey found that 65 percent of Democrats said they are more likely to purchase a product or service if the company supports efforts to reduce climate change, with 63 percent of Democrats saying the same of businesses that donate to Planned Parenthood. Most adults, including 64 percent of Republicans and 53 percent of Democrats, said they would purchase more from a company that supports undefined “religious liberty.” When religious liberty policies have been described, such as objections to birth control, there are signs of division, with 53 percent of Democrats supporting a contraception mandate and 53 percent of Republicans in opposition, according to a Morning Consult poll last year. “It’s hard for brands to stay neutral, when nearly every issue is so politically charged,” Grier said. Take the retail giant Target Corp. Target suffered a backlash from conservatives after it posted a statement in April 2016 welcoming transgender employees and guests to use the restroom or fitting room facility that corresponds with their gender identity. The next day, the American Family Association, a far-right Christian group, called for a boycott of the chain. But the survey also shows that consumers are willing to put their ideologies aside when they get to the cash register. Fifty-five percent of the public, including 64 percent of Democrats and 59 percent of Republicans, said they think they’ve purchased from a company that holds a position contradicting than their own. Responses varied from purchases a few times per week (9 percent), a few times a month (15 percent), a few times per year (15 percent) or very rarely (16 percent). Seven percent of respondents said they never buy from such businesses. But some consumers may not know where companies stand on relevant policies; 37 percent of survey respondents weren’t sure or had no opinion about whether they had purchased from companies with social or political positions that conflict with their own. Thomas Ordahl, chief strategy officer of the brand consulting firm Landor, part of WPP Plc, said in a Jan. 18 interview that even in this politically divisive time, it’s hard for consumers to break established habits. “Convenience, lifestyle and habits trump — for lack of a better word — people’s political views,” he said on the tendency of consumers to overlook their own ideologies when shopping. Indeed, consumers named cost (45 percent), quality of product or service (40 percent) and convenience (37 percent) as the top reasons why they’ve bought from a company with political or social views that conflict with their own. Experts said the poll results showing that majorities of both parties say a company’s stance on a social or political issue is important signal a shift in how the country perceives corporate America’s role in society — one epitomized in an annual letter on Jan. 16 to chief executives from Larry Fink, co-founder, chairman and chief executive of the investment firm BlackRock Inc.
Ordahl said the BlackRock letter in particular was a “shot heard around the world” for companies. “There is a larger, more profound trend happening around the corporate governance where, I think, businesses are increasingly seeing themselves as having a very important role to play in society — and are being held accountable to that,” Ordahl said.